Flisvos features a garden and apartments with a balcony overlooking the Cretan Sea. Located in the picturesque village of Maleme, the property is only 100 metres from the beach and 50 metres from cafes and restaurants. Offering an outdoor swimming pool and restaurant serving Cretan Cuisine on site, Panorama Hotel Apartments is located on the beach of Stalida in Crete. It offers studios with a balcony overlooking the mountain and garden. WiFi is offered throughout. Esperides Hotel is located in Myrtos, on the outskirts of Ierapetra, only 200 metres away from the beach. 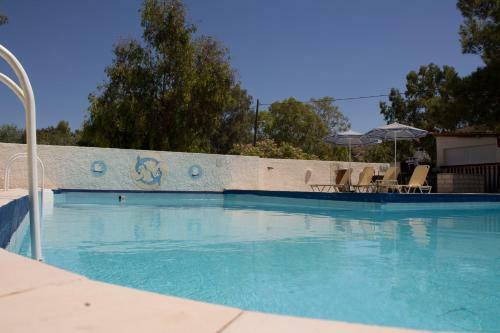 It offers sunny rooms with Wi-Fi, a traditional Cretan tavern, 2 bars and a pool. Adonis Hotel offers sea-view accommodation in the picturesque harbour of Agia Galini, in Rethymnon. The Adonis Hotel provides functional and tasteful rooms as well as self-catering studios and apartments. Safes are also available at an extra charge.